The 2018 Annual Eastern Snow Conference Meeting will be held June 5-8 in College Park, Maryland. 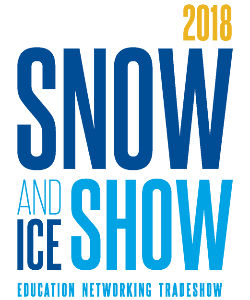 The annual conference features presentations from snow and ice professionals and an exhibit hall of winter maintenance solutions. Details. Clear Roads’ recent project to develop a snowplow operator and supervisor training program was featured in the February issue of Roads & Bridges. 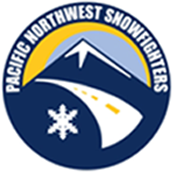 The project created a standard winter maintenance training curriculum addressing all aspects of a plow driver’s experience. The 22 training modules are available to any agency at no cost. Article. A dedicated office coordinator’s initiative to log salt use and truck operating hours for plow drivers led to an informal salt management process. The openly shared data encouraged plow drivers to participate in a friendly competition, which resulted in more efficient salt use for a Michigan agency. Article. Researchers identified in-cab and external equipment factors that cause operator fatigue and made recommendations to reduce, eliminate or correct these factors. 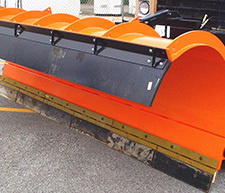 The project produced actionable and implementable improvements able to be applied to snowplow trucks. Project page. 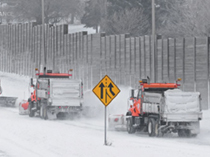 Researchers developed a software tool to estimate increased costs of roadway snow and ice control operations required for new roadway additions and configurations. These costs can then be considered during the planning process for new road projects. Project page. 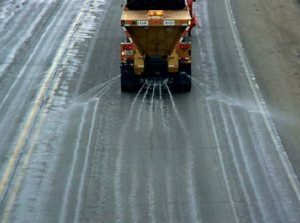 Clear Roads has published our annual compendium of papers on winter maintenance that were presented at the 2018 Transportation Research Board Annual Meeting. The 2018 compendium includes abstracts for 19 papers grouped into six categories, covering a wide range of winter maintenance issues. Report. Researchers in Japan evaluated disodium succinate hexahydrate (DSH) as an alternative to sodium chloride for use as a deicer. Laboratory and field test results for sodium chloride/DSH mixtures were promising, especially in limiting steel corrosion and environmental effects. Researchers recommended that DSH be used in liquid form as a prewetting agent or liquid deicer. Abstract and paper (requires TRB login). Researchers analyzed equipment fleet configurations to identify cost and time saving benefits from using tow plows. 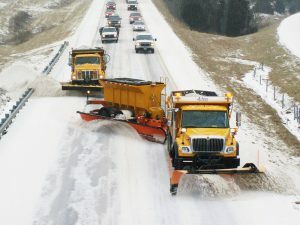 Adding tow plows to the fleet with less use of regular plows resulted in cost savings and helped clear roadways faster. Abstract and Paper (requires TRB login). 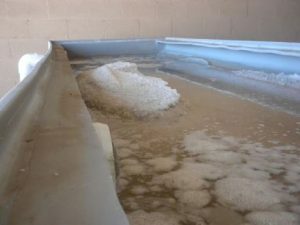 These guidelines are designed to facilitate the evaluation of brines for winter maintenance applications in Texas. Texas DOT maintenance professionals can use the guide to support decision making on the best brines to use based on availability, effectiveness, environmental impact, field performance and cost. Report. Eight different types of liquid deicers were evaluated on their performance in the field and laboratory. Researchers tested the effectiveness of the deicers under various temperature, environmental and roadway conditions. Optimal liquid deicer practices were recommended based on the evaluation results. Report. This report reviews the non-chloride-based deicers available on the market, including acetate-, formate-, glycol- and succinate-based deicing products. 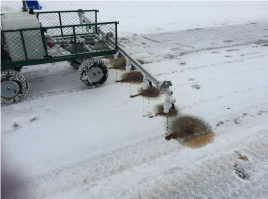 Researchers explored the feasibility of using non-chloride deicers as alternatives to chloride-based ones, and identified next steps to determine the viability of using non-chloride-based deicers in winter maintenance operations by MnDOT and local snow and ice removal providers. Report. 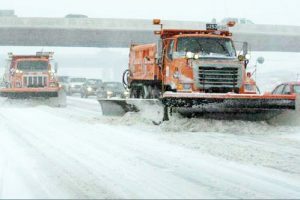 This document presents guidelines for the selection of snow and ice control materials for winter weather roadway maintenance applications in Texas. Texas DOT maintenance professionals can use the guide to help them address the challenges of winter roadway maintenance and provide safer and more reliable transportation solutions for Texas drivers. Report. Researchers studied chloride transport through surface water runoff and soil infiltration in a Minnesota metro area watershed. Chloride levels were monitored over three years, with results characterizing how weather influences chloride transport and accumulation processes as well as the residence time of chloride in watersheds. Researchers used the results to develop chloride pollution mitigation strategies. Report. 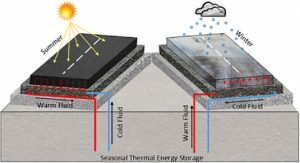 Researchers in Sweden investigated the anti-icing performance and effectiveness of a Hydronic Heating Pavement method which uses pipes embedded in the road to mitigate slippery road conditions. Results showed improved performance when the pipes are placed closer together, the depth of embedded pipes is reduced, large pipe sizes are used and when the road surface has a lower emissivity value. Paper. 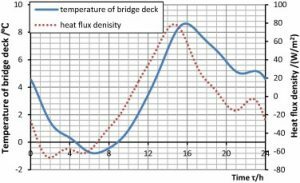 Before using a thermal anti-icing system to treat icy bridge decks, the surface temperature must be accurately measured. Researchers in China developed an inverse heat conduction method to determine the dynamic heat load of a bridge heating system. The calculations were then validated using control algorithms. Paper. The goal of this project is to develop a set of standard specifications that can be used by agencies across the country to specify carbide-insert plow blades. Having widely accepted specifications could increase buying power for state DOTs and potentially provide cost savings. Project page. Using weather, traffic and crash data from different sources, researchers will analyze the relationship between road weather conditions and the frequency of crash occurrences. They aim to develop crash frequency and severity models to aid agencies in identifying high-risk areas, provide predictive road weather information, design effective safety countermeasures and support decision making for road maintenance priorities. Abstract. This project aims to better understand how chloride from deicers enters Oregon groundwater systems. 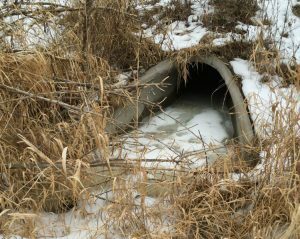 In addition, researchers plan to develop a deicer application management tool to help predict chloride levels in local stream water. Abstract.